French, 1573, Polychrome enamel on copper and silver. 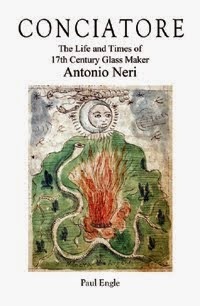 In L'Arte Vetraria, Antonio Neri's recipe book on glassmaking, he devotes the sixth chapter to making enamel. For Neri, this was a tinted form of opaque glass favored by jewelers and goldsmiths. The material was ground into a fine powder, added to a binder and painted onto glass or metals, usually copper, gold or silver. Once dry, the item was fired over a flame or in a kiln so the enamel would fuse to form a durable glossy coating. Talented workers could use various colors to paint entire scenes. Neri begins by showing how to produce what he calls “the material to make all enamels.” This is a neutral-white base to which he then adds various metal oxide pigments to produce color. He starts by mixing together thirty pounds of pure lead and thirty-three pounds of pure tin, both in a finely divided state. He heats them in a low temperature kiln that has a wide, accessible hearth. He roasts or "calcines" the metals, raking the powders around with special iron tools for many hours. This has the effect of oxidizing the metals without melting them. He sifts the mixture and boils it in a kettle of pure clean water. The kettle is removed from the heat and the contents are allowed to settle for a while. The water is then carefully poured off, carrying with it only the finest particles still in suspension. This liquid is saved, while the sediment at the bottom of the kettle is sent back for reprocessing in the kiln. He repeats the "decanting" procedure many times, and then carefully evaporates the accumulated liquid over a low fire. What remains is an extremely fine powdered tin and lead oxide mixture. Neri tells us that fifty pounds of this oxide is to be mixed with an equal weight of powdered cristallo frit. Cristallo was the coveted glass perfected by the Venetians on the island of Murano. "Frit" is the granulated glass before it is put into the furnace and melted. The recipe for cristallo had remained a state secret for over a century. It was the clearest, finest glass that money could buy and items made from it commanded top dollar among the richest families in Europe. Even after production methods became known to outsiders, Venice still controlled many of the raw materials through exclusive trade agreements around the Mediterranean. Neri was first to actually publish the recipes for making cristallo, in this very same book. It was made with pure white quartz pebbles from Pavia, mixed with purified salts derived from the Levantine kali plant, and decolorized with manganese from Piedmont. In order to complete the enamel base material, Neri adds eight ounces of white tartar salt (made from the dregs of wine), sifts the mix and carefully heats it in terracotta pots for ten hours. The result is ground again and stored in a in a dry place, in a sealed container for future use. The rest of the chapter is devoted to coloring this enamel base material; he always starts with a batch of either four or six pounds. He uses a large furnace pot to melt the enamel because even though the amount is relatively small, some of the pigments cause the batch to froth and swell violently. After adding the pigments, he lets the glass cook for a while, adjusts the color as necessary and then "washes" it several times. In this process, he throws ladlefuls of molten glass from the furnace-pot into large vats of cold clean water. The effect is to remove excess plant salts from the glass, which would ultimately foul the enamel. Finally, he forms the glass into individual dollops of about five ounces each; a size to which the goldsmiths were accustomed. For green enamel, Neri uses copper and iron oxides in various proportions, for blues he uses "zaffer," which is a cobalt oxide. He mixes green and blue pigments to obtain turquoise colors. Manganese produced a red wine color, for yellow, he adds the unrefined dregs of red wine (potassium) with a pinch of manganese. Violet is a mix of manganese and copper oxides. Finally, a word to the wise: Do not attempt to duplicate these recipes; fine lead powder is dangerous enough, molten lead enamel will evolve fumes that cause heavy metal poisoning. Remember that Antonio Neri was dead by age thirty-eight. * This post first appeared here 11 July 2014.